Epoxy body combination Redox sensor, Intermediate Junction reference design. The sleeve at the end of the sensor can be removed for cleaning. 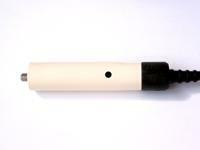 Suitable for difficult samples such as slurries that could block other reference junctions. 1 m cable, BNC plug. 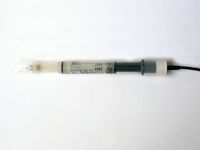 Epoxy body combination pH sensor, with screw-on membrane guard. Porous Teflon reference, 1 m cable, BNC plug. 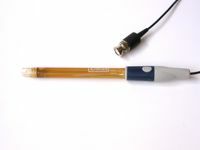 General purpose pH electrode with 1 m cable and BNC plug. 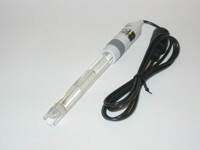 General purpose glass-body pH electrode with protective sensor guard. Suitable for samples with low temperature measurements. 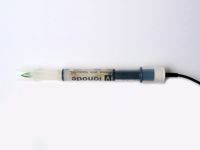 Silver/silver chloride reference, 1 m cable, BNC connector. Annular ceramic liquid junction. Epoxy body combination pH sensor, with unique Intermediate Junction reference design. The sleeve at the end of the sensor can be removed for cleaning. 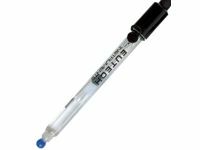 Suitable for difficult samples such as slurries that could block other reference junctions. Two sleeves are provided - one with protective forks, and a narrow sleeve suitable for insertion into meats and cheeses. 1 m cable, BNC plug.